Half-Day Tour (5 Hours): Choose the half-day tour and get picked-up at your hotel or another designated meeting point in the center of Parma to commence this fun food-themed tour of the region. If you're driving your own car, pick up your guide in Parma and begin the tour of northern Italian deliciousness in Emilia Romagna. The first stop is at a diary to sample some of the famed Parmesan (or Parmigiano) cheese. 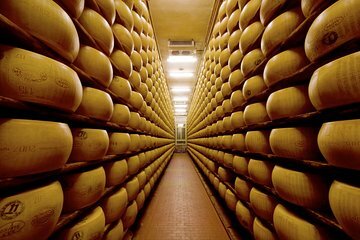 Often referred to as the 'King of Cheese,' Parmesan is aged for 12, 18 or 24 months and has a slightly different taste for each age. Learn about the process of making this amazing cheese and, of course, try some yourself. Next up: stop by a producer of prosciutto. In Parma, this cured ham is famed the world over. Learn about the process of curing prosciutto and sample some of the melt-on-your palate pork. After, visit the medieval town of Torrechiara for a photo op in front of the imposing 15th-century castle. Move on to lunch in a wine cellar in Parma where you'll get the chance to munch on cured meats, locally made cheeses and homemade cakes. Wash it all down with a glass of Malvasia or Lambrusco, a lovely sparkling red wine from the region. When you're done, head back to Parma or Bologna where the tour ends by being dropped off at your hotel or your own designated drop off point. Follow the tour above as part of your morning itinerary. Then, post lunch, go try some authentic balsamic vinegar in Modena and Reggio Emilia, handcrafted by masters whose techniques go back to the Middle Ages. Learn how balsamic is made and taste some of it, as the guide instructs on what makes excellent balsamic vinegar. In the afternoon, return to Parma or Bologna (depending on option selected), where your tour concludes. So sorry this is so late. Had a wonderful time with a local, Simonetta. She was so knowledgeable, we picked her up and drove to the ham factory, cheese factory and a winery with a delicious meal. It was as if we met a distant relative who was showing us around, and when she got into each factory she was met with warm and friendly reactions from the purveyors. We were able to witness first hand and get right in there with the cheese and ham makers. A truly rewarding experience. thank you for the lifetime of memories. There is no better way to see a new region by having a local show you around and get you knee deep involved. The CHEESE! I learned so much about cheese. The store is on the first stop so make sure you buy the meat there too. If small is an issue for you being nose plugs the meat factory was a little ripe. Our guide was knowledgable friendly and fun. Great for the whole family. Fantastic day in the Emilia Romagna region. Our guide, Georgia a native of Parma, was knowledgable and fun. Highly recommended. 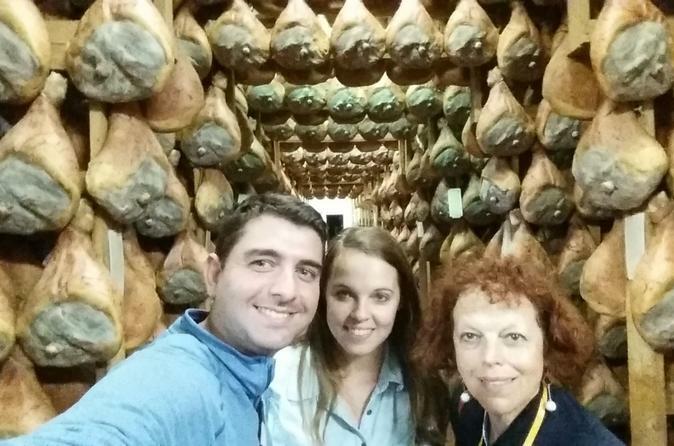 Our private Emilia Romagna Food Tour was one of the highlights from our trip to Italy. Our tour guide met us in a central location and drove with us to each stop for the first part of our tour. Our guide was extremely informative, providing local history, history on the cheese making process and history on the curing of prosciutto. Our lunch was simply delicious. After lunch we journeyed to Modena for our tour of a family owned aged balsamic vinegar farm. Our tour was much more than expected and if you love food I would highly recommend this tour. Best tour I ever was on!!! Paola and marchesi , father and son treated us like family. From the start to the end we were treated with respect and like kings. I would highly recommend this tour. Our tour guide Giorgia was a wonderfully passionate and proud Parma local. We enjoyed her personal stories about Parma's history and families food culture. We were running a bit behind due to traffic but we still managed to have a relaxing tour. Both the Parma Ham and The Parmesan Reggiano shop were excellent to see. The continued practice of the age old traditions in producing such quality products is admirable and made us appreciate Parma foods all the more. We had a nice quick stop at a beautiful old castle in the countryside before heading to a local vineyard for touring, tastings and lunch. The lunch and tastings were both beyond adequate in portions and quality. Such a wonderful way to delve further into this specific regions history, culture and traditions.